During the iPhone SDK event today, Apple announced that they would be releasing to developers the same APIs and Tools that they use to create iPhone apps. A software iPhone emulator for Mac OS X is provided to help with development. - Epocrates - popular drug reference application for physicians. Native iPhone apps will be distributed through the iTunes App Store, with wireless downloads. Developers pick the price, and get 70% of revenue. The 70% will be paid out to developers monthly, and there are no other recurring fees. The iTunes App Store will handle over the air updates to your applications. Developers of free applications will not be charged for Apple to deliver their applications through iTunes. All this will come with the iPhone 2.0 update, in beta today going to thousands of developers. Customers will get it in June as a free software update to iPhone users. 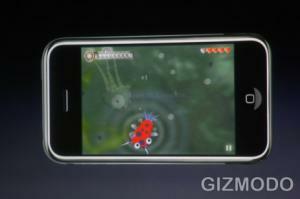 Meanwhile, iPod Touch users will be charged a small fee due to accounting issues. The SDK will be available for free public download, but there is a $99/year fee in order to publish applications to the iTunes App Store. Update: Apple has said they will not restrict VOIP (voice over IP) applications that use Wifi, but will not allow VOIP applications that use cellular networks. Additional iPhone news/details to be posted on our iPhone Blog at https://www.macrumors.com/iphone/.